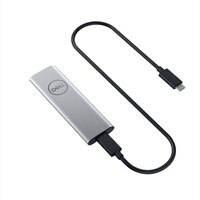 Dell Portable SSD, USB-C 250GBOne of the thinnest, most compact portable SSD storage devices, the Dell Portable SSD, USB-C 250GB provides fast transfer speeds of up to 550MB per second with high quality, reliable SSD storage. Small, lightweight, and bus-powered directly from your computer, this device offers ultra-portable storage on the go with quality and reliability you can count on. One of the thinnest, most compact portable SSD storage devices, the Dell Portable SSD, USB-C 250GB provides fast transfer speeds of up to 550MB per second with high quality, reliable SSD storage. Small, lightweight, and bus-powered directly from your computer, this device offers ultra-portable storage on the go with quality and reliability you can count on.